Goodbye Diapers – Potty training using negative and positive reinforcement. Potty training can be a difficult en devour even for children who are not on the spectrum but in our children there are millions of different things that can affect the out come. Not only does not wearing a diaper feel different but I am sure that the sensation of peeing and pooping in a diaper also feels completely different then doing so on a toilet. The smells in the bathroom smell different. The sounds in the bathroom are all different. A new awareness of the sensations that go along with going to the bathroom is different. Fear of the entire process in itself can be overwhelming. Many children also have issues with constipation or diarrhea and worst yet a combination of both which can make the task that much more difficult. Not so long ago Rebecca talked about how she was able to breakdown potty training into a way that MJ could understand. She used human anatomy to help MJ see the physical processes which take place when the human body actually rids itself of waste. Our approaches were completely different so we thought we would share my approach with you as well. Does your child seem interested in the potty chair or toilet, or in wearing underwear? This is a hard one for kids on the spectrum especially if none verbal. They may have absolutely no interest in a potty chair or toilet and the thought of wearing something other then the diaper they have been in for the last 3 or more years is completely out of the question. Can your child understand and follow basic directions? Many of our children have a hard time following directions which have more then one part until they are older and this again becomes extremely difficult when a child is non- verbal so waiting for this queue from them may never happen. Does your child tell you through words, facial expressions or posture when he or she needs to go? Indirectly speaking you know when your child is probably going to the potty in their diaper but do they actually want to convey this message to you? Not always. I know in the case of our son he would hide to go to the bathroom so I knew when he would come out from behind the couch that I should probably check his diaper. Does your child stay dry for periods of two hours or longer during the day? Yes! One of the signs that we can check for in our children on days when diarrhea isn’t an issue. Does your child complain about wet or dirty diapers? If your one of the lucky few who’s children really dislike the sensation of being wet or dirty in a diaper then you may have a much easier time to potty train but this comes down to how long do you usually allow them to sit in a dirty diaper to begin with. For us the Monkey has always had extremely sensitive skin and so we would check his diaper almost every hour, more often if he had just finished eating or drinking something. This meant that he rarely sat in a dirty diaper for very long and so this as never an issue with him. Can your child pull down his or her pants and pull them up again? I know many parents of children both on and off the spectrum who had difficulty keeping clothing on their children once they learnt how to take the items off themselves. In our case the Monkey was never able to dress and undress himself till the age of 5. He has a lot of gross motor and fine motor delays and so he would not grasp anything with a closed hand. Can your child sit on and rise from a potty chair? I am sure he could have easily done this at the age of 3 but getting him on the potty chair to begin with was a task in it self. Most of these queues were not there when we decided to start potty training and some of them I don’t think would have evolved until now had we not taken the bull by the horns and just went ahead with trying. You might be wondering why we were so eager to potty train? This partially has to do with the fact that the Monkey has such sensitive skin so peeing n a diaper caused rashes but mainly we had to do it because my Monkey is not a little boy. He was born weighing 10 lbs 7oz and was 23 inches long. 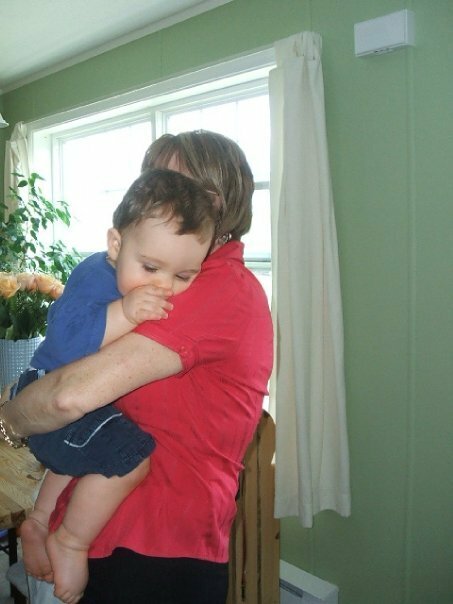 This is a picture of my Monkey with his grandmother at the age of 10 months. In this picture he is actually wearing size 2 clothing. We started the Monkey with the videos and books at 3.5 yrs. We picked out a car themed potty, purchased some car stickers to put on a reward board, we talked about the potty, we let him watch us go to the potty, we tried to bribe him to go to the potty because nothing else was working. We even tried sitting him on the potty whenever we could see that he was on his way to hide somewhere to go and this would simply cause a huge meltdown and he would hold it until his diaper was back on and he could hide again. It was one of the most frustrating processes we have ever done with him. One day I just said I had enough. I took the diaper off and put a pair of underwear on him and I let him have his meltdown. Once he was calm and not asking me for a diaper then I put a sticker on his reward board, if he even went near the potty I would give him sticker. This went on for a good little while and I waited to see when he would try to go hide to go to the potty. When that time came I grabbed him and sat him on the potty and all hell broke loose. Meltdown # 2 in 3 hours, hurray for us. I waited a little bit trying really hard to tell him that it’s ok remember mommy goes pee on the potty and I showed him the books with the pictures of little boys peeing in the potty while he screamed his little heart out. Eventually I had had it and I took him off the potty and pulled his pants up still with no pee. Then he had an accident! He peed all over the front of his pants and on the floor and this, ladies and gentlemen, was the straw that broke the camels back. You see the Monkey hated having a bath and he hated being wet unless it was in a pool and everyone else was wet also. 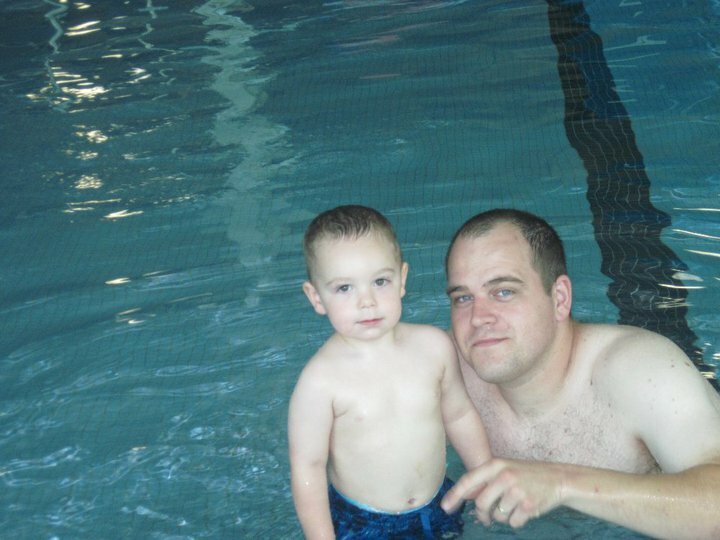 So after he had the accident and he was now standing in a puddle, pants glued to his legs and me having to give him a bath we had meltdown #3. Once the bath was done I put another pair of underwear on him and we waited. Every time I went pee that day I showed him, look how mommy is going pee in the potty and when I am done I’m all dry, no bath for mommy. That day he had 3 accidents and 3 showers and by supper he went pee on the potty and every time after. I understand that to some of you may think this sounds cruel but I simply used a negative reinforcement to obtain the desired result. This is something that has been proven to work with children on the spectrum ( read about this here). So in the Monkeys case it was merely a matter of which option is the lesser of two evils. A) If I pee in my underwear then I have to have a shower which I hate more then anything or, B) If I pee in the potty I get a sticker and I do not have to have a shower. He chose B because although the potty was different it meant he didn’t have to have a shower. This also means that he was making the decision to go on the potty rather then being forced to go on the potty. Having him feel like it was his decision and he was in control I think also played a big part in his success. After that day the Monkey was day trained but at night he still needed to have a diaper on. It wasn’t uncommon for the Monkey to go a day or two without pooping but after waking up a few mornings to a poopy diaper I realized he was holding in his poop until he had a diaper on. This then became a pattern. He would hold it in all day, sometimes two days then finally poop in his diaper. Now we started a whole new issue. Not only was he holding in his poop till he had a diaper on but his poops were getting larger and they were hurting him when he would finally go so he started holding them in for longer. I then turned to bribery. He really, really wanted this Bumblebee transformer which turns into a car or a robot and I mean a big transformer not a little one. One evening you could see he was uncomfortable and he really had to go poop but I had forgotten to get his overnight diapers. I just needed him to poop and I tried to tell him it’s ok pooping on the toilet is just like peeing in the potty but he refused. So I showed him the picture of the bumblebee transformer which we told him he could have once he pooped on the potty and said, “if you poop on the potty mommy will have daddy go buy him for you right now.” I didn’t take him 5 minutes and he pooped in the potty. The hubby drove to the store and bought him his toy as his reward for pooping so in this instance we used a positive reinforcement (read more on this here). He did something he did not like to get something that he wanted. Pooping was still a bit of an issue however so we ended up purchasing a large pack of hot wheels cars and would give them to him as rewards for going poop. Once he was pooping on the potty everyday without needing to be shown the reinforcement of the car then we turned to giving him a little sticker or a treat once he pooped and after a few weeks we didn’t have to give him anything. Like I said above Rebecca used an entirely different approach, which you can read here, and I am sure other parents have been successful doing something completely different but for us using negative and positive reinforcements worked the best. We have actually used this method in a lot of different scenarios like going to the store, for example. Obviously you need to choose wisely. Not pooping can be dangerous and painful so you wouldn’t want to use a negative reinforcement here where as with the peeing he wasn’t holding his pee in so using the shower as a negative reinforcement worked well. In either case he gets to decide the outcome. Either I don’t poop on the potty and I do not get my toy or I do and I get my toy. Either I pee in my underwear and have to take a shower or I pee in the potty and I don’t. What approach did you use to potty train your kids and at what age were you successful in doing do? Oh boy this is my life right now! Coop will sit on the potty forever and NOT pee! He’s holding it until the diaper goes back on. He’ll actually bring me the diaper. Sigh. This post is so helpful. Thank you! So glad you find it helpful. Potty training is so hard especially for our little guys on the spectrum. Hang in there and find that one thing that he either hates or wants more then anything else and you’ll be able to get him to go. So here is our problem….cooper LOVES watching cartoons more than anything in the world. And he will take the bribe in a hot second. He will run to the potty and sit there perfect but no pee. I believe he’s actually holding it. But he wants the movie so bad so I feel awful for him. Do I just keep withholding it? He doesn’t really hate anything so that wouldn’t work for him. We have to go with the loves! I would withhold it. Yes. If you are able to get him on the potty with no issues then I would withhold it. Get him to sit on the potty as long as he will sit there. If he’s good with sitting on the potty then while he is there give him a drink, read him a book etc… just don’t give him what he wants till he goes. Make sure that he understands what is being requested of him though also. Show him visual queues of going to the potty and what it looks like and what it means but don’t give him what he wants till he gives you what you want. It sounds so mean I fully understand that but positive and negative reinforcements really do work but you need to be consistent and hold out. I hope this helps. It does! Thanks! I think I need to commit to the amount of time it will take:-) I’m so ready though. Thanks again! No problem. It is a huge task that is for sure. I had to be consistent for an entire day and then continue to stick with it. Good luck.